1. The event runs for the period of 1st - 30th APRIL 2012. 3. At-least a tbsp of coriander seeds must be used or a bunch of mint leaves must be used. 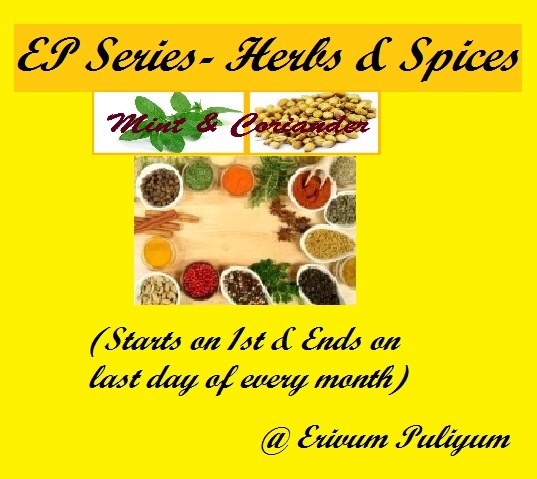 Subject: "Mint Leaves & Coriander Seeds"
5. Recipe must be linked to this event announcement page and to my page. 6. You can link both Veg & Non Veg recipes. 8.Usage of logo is appreciated for all entries. That is not the end to it; There are 4 awards for the BEST INNOVATIVE RECIPE AWARD, TOP CONTRIBUTOR AWARD,BEST HEALTHY DISH AWARD & PARTICIPATION AWARD. So,Folks put on your innovative caps and think tight, do right and link in your recipes at the earliest before 30th April,2012. Nice Event, Surabhi.. Happy Hosting!! Happy hosting :).. will send something soon! Happy hosting! Soon link my entries. Linked my entry and will post some more. I have linked the recipe, will send the details later. Nice themed event! I absolutely love mint..thanks! Lovely choice of spice and herb.